Venice actually does have campgrounds—and would you believe this one is right on the beach? 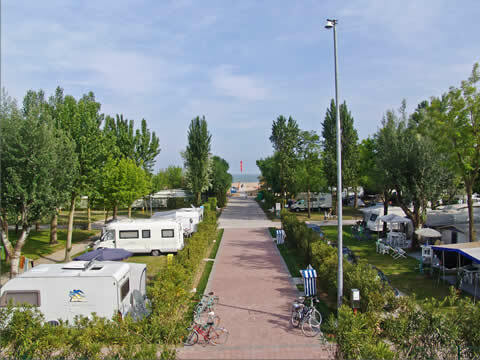 This place is one of the largest campgrounds in all of Europe, and that’s no joke. It's literally like a mid-sized town, only made up entirely of campsites. Just to give you an inkling, it stretches over 173 acres and can comfortably fit more than 12,000 campers (that's not a typo: more than twelve thousand campers). It features 30 shops and 7 bars & restaurants (not counting beach bars)—most of them along a central boulevard lined by low-rise shopping centers. It has an impressively-sized water park with six swimming pools, and a fabulous beach: families cavorting, yellow sand, 200 yards deep, and stretching for miles (of which 1.2 km belong exclusively to the campground). There is a two-night minimum stay (a 7-night minimum from July 7 to Aug 21). It’s open mid–April to the end of September. If you're looking for a hotel near a particular sight, just go to that sight's page and, in the sidebar on the right, you'll see a list of all the nearby hotels (with "Reid Recommends" choices preceded by a little RR icon: ). Hotels: €1 pppn (per person per night) per star rating. (So a couple [2 people] staying three nights [2 x 3 = 6] in a four-star hotel [6 x €4 = €24] would pay an extra €24. Some hotels have folded the fee into their quoted rates; most properties tack it on as an extra when you check out. Just be prepared. Book ahead in summer and during Carnevale: Venice is way more popular than the number of beds it has, so while in the dead of winter you can often show up and find a good place to crash easily, the best rooms (and the best-value hotels) are booked well in advance for the summer months and the two weeks prior to Ash Wednesday (when Venice breaks out the fancy dress and masks for its famed Carnevale celebrations). Same goes (though less so, and more at the chic and high end hotels) during the Venice Biennale art festival and the Venice Film Festival. Pay extra for A/C in summer: No matter what kind of lodging you pick, if it's summer (a) try to get a room with air-conditioning and (b) even if you can't (or you can but have a hankering for some fresh air) resist the urge to open the windows to your room. Venice is, I believe, the primary breeding ground for the mosquito population of Southern Europe, and precious few Italian hoteliers have discovered that newfangled invention called window screens. Keep the windows shut, or prepare to be bitten. Avoid Mestre: Any hotels with an address in "Venezia-Mestre" is actually in the dull, modern, industrial suburb at the mainland end of the bridge over to the real, ancient Venice you came all this way to see. Do not stay in Mestre! You'll spend more time and money commuting each day in an out of Venice proper than you will save. This article was written by Reid Bramblett and was last updated in May 2013 .